It is illegal to text while driving. Many people do it anyways. I, on the other hand, only text when I am at a complete stop. I just found out recently, though, that apparently that’s illegal too. So I turned to a dictation app (well, I’m still texting at red lights but trying to integrate it). 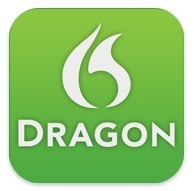 The app is called Dragon Dictation and it is amazing. It is VERY good and can recognize even fairly fast speech with accuracy. To truly test it out, I subjected it to Lose Yourself by Eminem. It didn’t stand up against rap . . . Awesome. You’ll notice that it actually took some of his slang and corrected it. But seriously, it’s a great app and it’s FREE. Get it here. Play around with it and post anything amusing you do with it. Next postGoogle Plus+: Success or Failure? Pingback: Chalk Talk | Angela Maiers Educational Services, Inc.